Sunday-Taco's, refried beans and corn. For breakfast we usually have fruit, oatmeal, cold cereal, biscuits, gravy. For more Awesome recipes and dinner ideas go over and check out Menu Plan Monday. I do have a recipe/food blog...here is a goody I just made recently....Perfect for St. Patties Day! Those brownies look SO good! 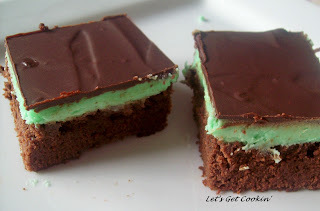 Chocolate + Mint = Heaven for me!